PRODUCT: Miro Model 20-Base-Strut-12 Rooftop Gang Conduit Support, 20" Wide Unitstrut®, 4-1/2"- 12" Height Adjustable, 16 x 18"Polycarbonate Base. 1 unit. Price/Each. DESCRIPTION: A pipe stand with a Unistrut® pipe support system used for ganging roof-mounted gas pipes, electrical conduit, solar piping and other mechanical piping. Unique design absorbs thermal expansion and contraction of pipes thus preventing damage to the roof membrane. 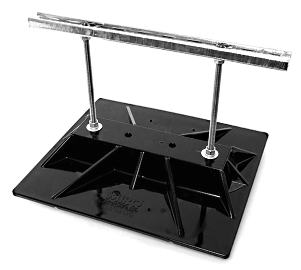 Pipes rest on a 20" length of Unistrut which is mounted on an oversized Polycarbonate base. P ipes are then be fastened by using typical clamps and hardware locked to the Unistrut. Base Size: The deck base is 16" by 18". Max Pipe Clearance: Can adjust in height from a low of 4-1/2" to a high of 12" in elevation above the roof membrane. Max Load Weight: Maximum load weight may not exceed 380 lbs. per pipe stand. OPTIONS: Available in Hot Dipped Galvanized, Stainless Steel, heights of 7 and 12 inches, and widths of 12, 16, and 20 inches. Miro 16 inch Wide x 18 inch Long Rubber Support Pad. Provides 1/8 inch protective barrier between roof membrane and rooftop equipment. Features 100% recycled rubber and raised lip for slip resistance. Price/Each.